A man who woke up naked in a stranger’s house in Florida late on Monday morning is unlikely to face criminal charges, according to the officer who found him there. The man, whose name has not been released, was discovered in the house on Sloat Court hours after his car was towed from the nearby Choctawhatchee Bay. Fort Walton Beach Police Officer Marcus Montgomery was in the kitchen with the homeowner discussing the car found in the bay when the man appeared, wrapped in one of her towels. “He said, ‘Hi, I’m Joe and I have no idea where I’m at right now,’ ” Montgomery said. “He kept saying how he didn’t know where he was at, didn’t know how he got inside the house and didn’t know where his car was at.” A neighbour had spotted the man’s clothes drying on a fence when the car was being recovered. The homeowner was out of town at the time. Her neighbour had checked the house after the car was found, but all the doors were locked, he said. When she returned, Montgomery went to speak to her about looking at security camera footage of her yard. “I was looking at the manual and we hear this clicking noise and she looks down the hallway and there he is, standing there, lost and disoriented,” Montgomery said. He’d been sleeping in an upstairs bedroom, which the homeowner hadn’t thought to check. The man, who is moving back to Pennsylvania to live with his parents, had been out Sunday night celebrating his team, the Pittsburg Penguins, winning the Stanley Cup. His girlfriend called in a missing person’s report when he didn’t come home. 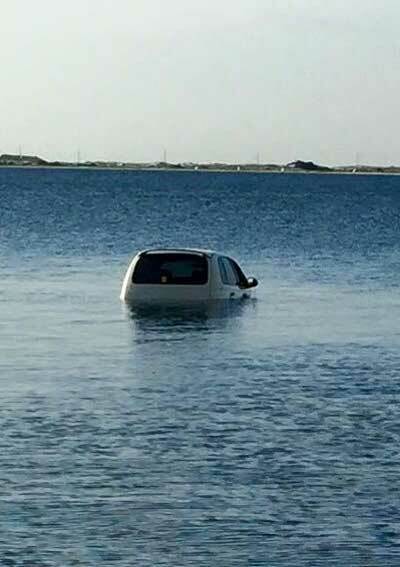 His car was found about 100 yards off shore in water so shallow the tow truck driver walked out to it and hooked it up to tow it in. No harm, no foul, to her. He's the loser, the one who lost his car and his dignity.